Exponents are really fairly easy to work with. If you are figuring the area of a square, you multiply a side by itself. So, when you multiply anything by itself, we say we are squaring the number. If you want to multiply something times itself three times, you take the number to its third power. Because the volume of a cube is side * side * side (all sides are equal in a cube) You might say we are cubing the number. For a definition, check out dictionary.com. Oh, remember how we can assume everything is being divided by 1? 5 is the same as 5/1 which means we can express 5 as a fraction which is what makes it a rational number. We're making another assumption. If there is no exponent, It's 1. So the variable x is the same as x1. So, x3 is the same as x*x*x or x times itself three times. It's a kind of shorthand, that turns out to be super useful (as I'll explain). x4*x2 would be the same as (x*x*x*x) for x4 times (x*x) for x2 which would be (x*x*x*x)(x*x*) or x*x*x*x*x*x or just x6. If you're still with me, there's a kind of neat implication with all of this. x4*x2 is x(4+2) or x6. So, when you multiply one term times another, assuming the base is the same, just add the exponents. When dividing factors with the same base, subtract. So (x*x*x)/(x*x) = x. If we used exponents this would be x3/x2 = x(3-2) or x1 which is x. Which brings us to something which, at first, looks really strange. What about x3/x3? We know that anything divided by itself is 1, but using our rule we would get x3/x3 = x(3-3) or x0. Does this mean that anything to the zero power equals 1? Yes, yes it does. Anything to the zero power equals one. I like to focus on the Positives, but - what the heck. I really enjoy negative exponents because they are really easy but they seem to freak out a lot of people. So, follow with me and we can show off to our mathematically impaired friends. Oh, by the way, the term "mathematically impaired" does not really exist. When you say it, you should always use a kind of snarky tone. You can be ignorant of mathematics, but it's not something that some have the power to learn and others don't. Remember when we were talking about dividing with exponents, you subtract the exponents? x3/x2 = x(3-2) = x? What would happen with the expression x2/x3 ? We could have written that as x*x/x*x*x which would yield 1/x right? Now we get x(2-3) which is x-1 which I am now happy to tell you is 1/x. Anything to the negative power is one over that thing. Now, what about the term 1/x-2 ? The saying I like, which never really caught on, is - move it across the line and change the sign. Anyway 1/x-2 is x2. I just love the logic of math. So, here we go. I'm assuming your familiar with the square root symbol √ ? It looks a bit better when you draw the thing - I don't know, does it look better when I draw it? (see above). Square roots ask the question, what times itself equals this number. As an example, let's try √9. The obvious answer would be 3 because 3*3 = 9. There's a second correct answer because (-3)(-3) also equals 9. So, we would say the answer is plus or minus 3. 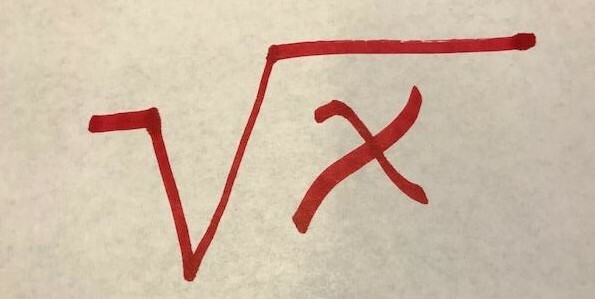 Now, the symbol, by itself, assumes a square root. If we put a number in the crook (see below), we are taking different roots. In the illustration we're doing cubed or third root. No big whoop, right? The cubed root of 8 would be 2 because 2*2*2 is 8. 2 times itself 3 times is 8. Notice that with cubed roots the negative doesn't work. (-2)(-2)(-2) = -8 not 8. So, we get two answers only when it's an even root. One final thing. Do you see that √9 * √9 = 9? 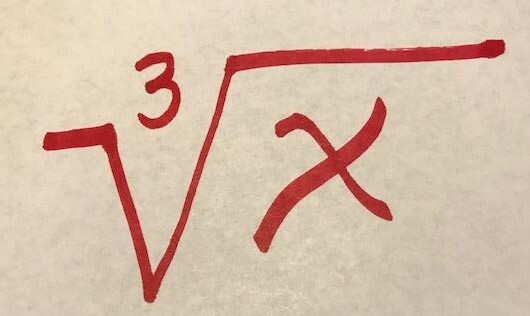 Since square roots are asking the question - "What times itself = this number, a square root times a square root would definitely have to equal that number. Check it out, remember the square root of 9 is 3, and 3*3 is back to 9 again. Oh, the square root of 9 might also be a -3, and -3*-3 is also 9. Any square root times itself is the number under the square root symbol. Moving back to multiplying items with exponents. 92*9 = 9(2+1) = 93. Well, lets apply this principal to something a little bit different. 91/2 * 91/2 = 9(1/2+1/2) = 9(1) = 9. Here we have something times itself 91/2 times itself and it equals it's base, 9. It's just like when √9 * √9 = 9. Which should lead you to the conclusion that another way of writing √9 is 91/2. Another way of writing the third root of nine would be 91/3. If you're following all this, you're doing great. This is advanced stuff! The simple rule is that there will be one less change in direction than the highest exponent of the variable. Ahh, it's a fine line that separates me droning on forever explaining a concept you understood three paragraphs earlier, and me bringing you to the edge of enlightenment and then stopping. These confuse a lot of people. If you find my explanation too long or too short - that's what this form is for. Help us out and tell me what is needed.